The broadleaf, also very commonly known by its botanical name griselinia littoralis, is an evergreen tree. Unlike many hedge plants, it is an excellent choice for coastal hedges, as it will feel right at home in a seaside garden. This griselinia species is not only native to New Zealand, where it is commonly known by its Maori name Kapuka, but also the coastal areas of Brazil and Chile. It bears glossy, green leaves and produces yellow-green, inconspicuous flowers. In fact, its stem and branches are also green, which makes it safe to say that the broadleaf is truly an evergreen hedging plant. The broadleaf is the only species from the griselinia genus that is also grown in Europe, where it is restricted to areas with a mild oceanic climate, such as the UK. Griselinia littoralis tolerates salt-laden ocean winds, which is one of the primary reasons why people choose this species when creating a hedge. As many plants do not withstand strong winds and high salt conditions, it is always a little tricky to grow a hedge in a seaside garden. The broadleaf has the ability to form a neat, formal, tidy and not too thick evergreen hedge, which also makes it ideal for smaller gardens. It is worth noting, however, that extremely strong, dry and cold winds may be too much to bear, even for a broadleaf hedge. If your house is situated right by the sea, we recommend you to opt for an oleaster hedge instead, as oleaster is even more tolerant of cold, dry winds than griselinia is. It is nothing new that the griselinia littoralis is considered a genuine seaside plant. In fact, this quality is reflected in its botanical name, as “littoralis” literally means “growing on the coast”. Though the origins of the broadleaf can be traced back to New Zealand, it is not an unfamiliar sight among British gardens, as the species has been cultivated on the south coast of the UK for a long time already. Its tolerance of coastal sites is really what sets the griselinia littoralis apart from most other evergreen hedging plants, as the number of plants suited for hedging in seaside gardens is very limited. The broadleaf, however, will not bow to strong, salty sea winds. Griselinia littoralis will also not feel out of place in the moderate, rainy climate of the UK. In fact, it will feel right at home in our part of the world. It has even been awarded with the Award of Garden Merit by the Royal Horticultural Society due to its amazing performance under UK growing conditions. Yet, its tolerance of difficult conditions is not the only reason why the broadleaf is so appreciated as a hedging plant. As it is a fast grower, the species will make a great screening hedge, which will provide you with year-round privacy, within no more than a few years. In addition, its glossy foliage will simply make your garden look beautiful even during the winter months. While griselinia littoralis is an evergreen hedging plant and will generally not shed its leaves, the species is not entirely hardy. It will last down to about 10 to 12 degrees of frost. During harsher winters, it is absolutely essential that your broadleaf hedge is protected from the cold. Luckily, this type of hedge is most commonly grown near the coast and oceanic climates rarely have winters that are cold enough to take a griselinia littoralis hedge down. Its clusters of flowers appear in the summer and while they are fairly inconspicuous, they are notable for not having any petals. In late summer or early autumn, these blossoms are followed by small, dark berries, which are a favoured source of nutrition to birds. A broadleaf hedge will prefer a position in full sun. Semi-shade is tolerated, but it will not thrive in full shade. Though a griselinia hedge can handle exposed positions, it cannot deal with extremely strong, cold winds and will therefore be best off in a slightly more sheltered position not directly on the seafront. While the species is not particularly demanding when it comes to soil types, it will do best when planted in a well-drained, fertile light soil. A slow release fertiliser is beneficial, especially during the first few years. 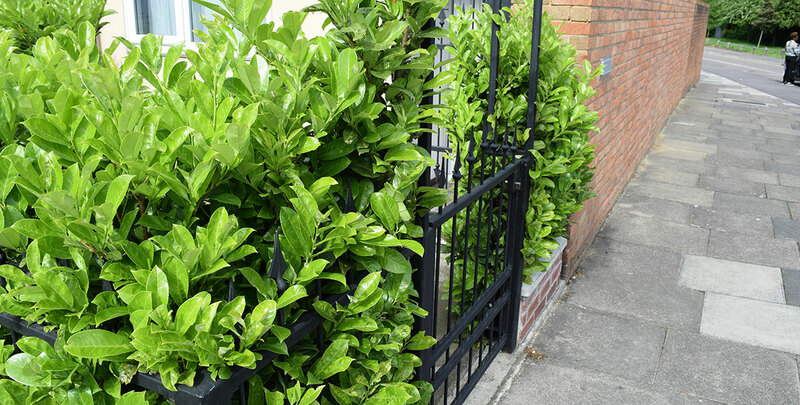 With an average annual growth rate of 30 centimetres, griselinia littoralis is a relatively quick grower that can grow up to 8 metres in height when used as a hedging plant. Fortunately, it is also easily trimmed. While the broadleaf is not a hedging plant you commonly see at garden centres, experts have already hailed the species as an excellent plant for seaside hedges a long time ago. As a majority of evergreen hedging plants or even deciduous hedging plants are not able to deal with strong, salty sea winds, a griselinia littoralis hedge is simply the perfect hedging plant if your garden is located in a seaside town. It is not very hardy, but as coastal locations rarely suffer from extremely harsh winters, this hedging plant will decorate your garden and provide your privacy even during the relatively cold winter months. Some people even claim that the griselinia littoralis is an excellent species for topiary purposes. We would generally recommend using slower growing species for topiary, but we can certainly understand why people would want to find as many ways to enjoy the glossy green leaves of the broadleaf as possible. In fact, almost all the parts of the broadleaf have a fresh green colour, so if an evergreen is what you are after, this hedging plant certainly delivers.